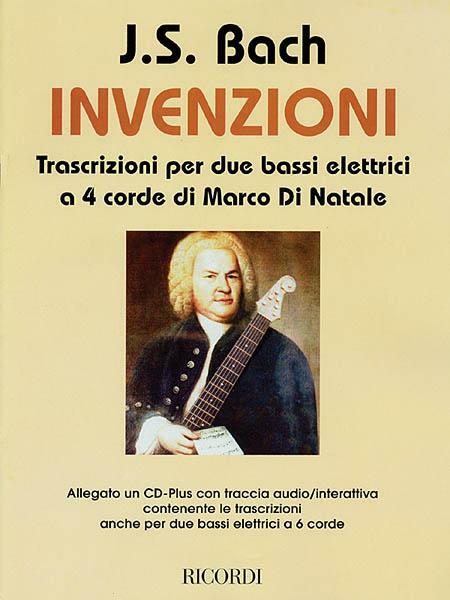 BACH J.S., INVENTIONS, Transcriptions for 2 Four-String Electric Basses. CD-ROM TAB. The Bach Two-Part Inventions are among the most famous of Baroque keyboard pieces. Marco Di Natale has transcribed this music for two electric basses, making a Bach to Rock connection. Included are 5 pieces: Invention No. 1 in C Major, Invention No. 2 in C minor, Invention No. 6 in E Major, Invention No. 8 in F Major, Invention No. 13 in A minor. The score also comes with a CD-ROM, allowing a bass player to listen to the pieces, and play along with either of the two parts at any tempo. The CD-ROM also may be used in a conventional CD player, with each of the two parts on a separate stereo channel. This Italian publication is fully translated, with Italian and English text. 36 pages.